"My grandfather was a London bus conductor. I clearly remember him in his smart uniform with his ticket machine strapped over his chest. This design reflects some of my fondest childhood memories and my love for mid-century design." 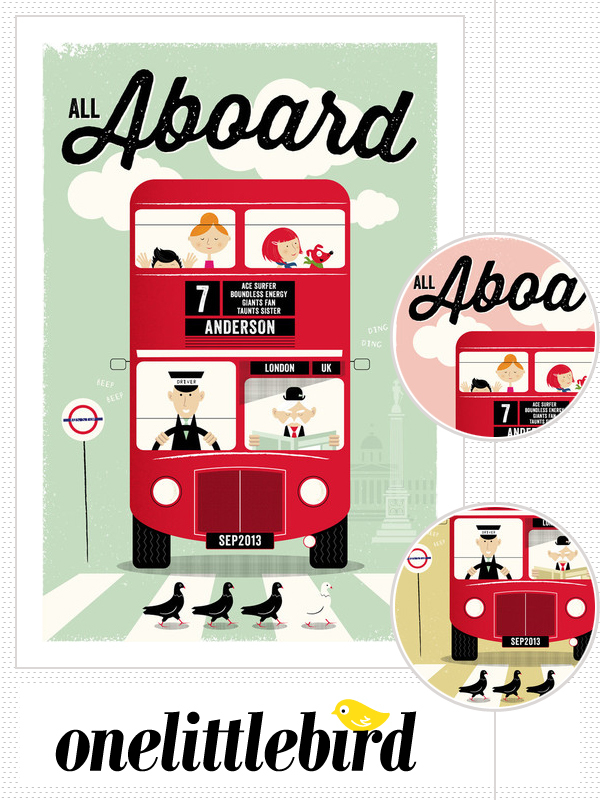 'All Aboard' is completely customisable too. It is available in three different London themed background colours (Bloomsbury Blue, Piccadilly Pink or Greenwich Gold), you can choose from six different sizes, framed or unframed, plus all the text signage on the bus can be personalised! I think that is such a fantastic concept, to be able to customise the text and colours yourself at point of purchase. Such an easy way to create a very personal and unique piece of art for a new baby's nursery.